The daring lime greens, rich blues, popping violets and glowing tones of orange can create life in any room with a burst of individual personality. 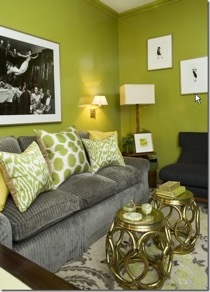 A lime green is a refreshing burst of energy for dark rooms of all sizes. It helps you to walk into the room and feel revitalised Though it’s usually only seen on accent walls, a dimly lit room makes a perfect case for all four walls to be lime. It’s an ideal way to cheer up dens and living rooms that are in need of a vibrant effect. Continue your confident streak and don’t be afraid of beautiful, bold oranges. They create the attention-grabbing effect of red without the over dramatic effects. Since they contain hues of red, they possess a warm yet bold effect. 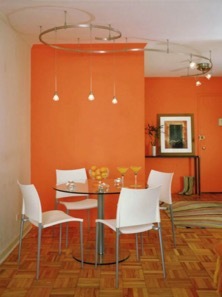 It also creates a comforting atmosphere as a colour that is easy on the eyes. Purple can add a whirlwind of charm and character to an all-white bedroom or living room. It can add personality, style and modernity. Purple is also linked to royalty so give your home the royal treatment with a touch a purple. 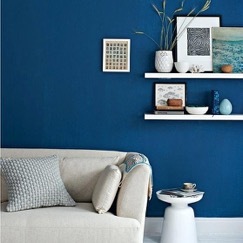 Adding blue to your home creates an instant calm and peaceful feeling. Since blues go well with either light or dark colours it gives you the chance to further explore room décor options of all types.